Innovative Components offers a wide variety of standard, vertical, and horizontal liquid level float switches. Standard float switches are available in stainless steel, and plastics, including PVC, polypropylene, or PTFE. Liquid level float switches are used to maintain a safe level of fluid within a tank or container. They can assist even more efficiently by automating the dispensing of liquids, whether into or out of the tank to maintain the optimal level, and can be connected to an alarm to sound when the optimal level is not met. 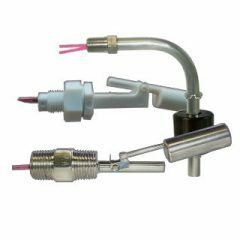 With the ability to customize the length, they can even be used to control the filling of all types and sizes of vessels from small to large tanks. These versatile liquid level float switches are typically hard mounted into the tank wall or extend further into the tank using extension tubes and liquid tight tube fittings. Most of our vertical liquid level indicators can be changed from normally open to normally closed by simply removing the retainer and flipping the float. When the level switch is in the normally open mode, it is OFF until the float is lifted by the liquid and makes contact with the elastic ring, turning the switch to the ON position. When the switch is on, which allows for the tank to be automatically start emptying the tank until the switch turns back off, which then would tell the system to start filling the tank. This ensures that the tank level never gets too low. The applications for this simple switch are endless. Vertical float level sensors can be mounted in the top or the bottom of the tank. This gives the ability to have two points of contact, creating a system of emptying and filling the tank as efficiently as possible with minimal down time. The vertical float level switches have various mounting threads and can be made from stainless steel, and plastics for your budget and needs. Horizontal float type level switches mount on the side of the tank. This lets you have the ability to set the exact level you would like regardless of the size or shape of the tank. With various mounting threads and materials available, we can design the perfect solution for your problem.